Since February is National Embroidery Month we’re taking a look at the well-known craft that’s remained popular for centuries. Embroidery starts when an outline is drawn on fabric and then stitched over with a back stitch. This will create a solid line in thread. 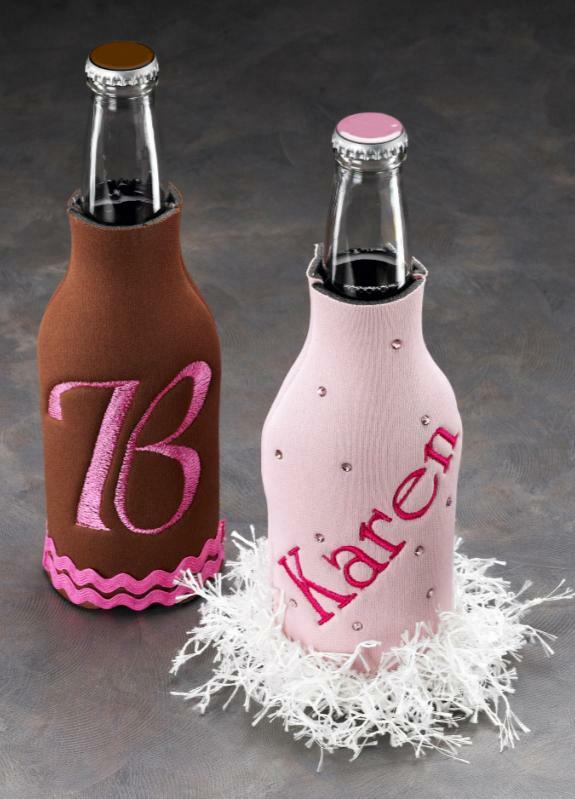 Projects ranging from handbags to ornaments can include embroidery. Traditionally, embroidery was limited to being a hand-craft but with technological advancements, new computerized machines have modernized the craft. One of the older forms of embroidery is Redwork. Here’s an article on Redwork Embroidery by our resident Craft Expert, Maria Nerius. Redwork will have you seeing red only because it is created with a red cotton thread! It is a simple embroidery technique that is one of the most beloved traditional crafts. Redwork is believed to have originated in Europe in the 19th century. It is believed to have made its way to America before the Civil War by immigrants. This style of embroidery was most popular with the working classes as it was not out of their price range. It’s first popularity had much to do with its affordability, simplicity, and availability. In the United States penny squares were sold; penny squares were 6” muslin square marked with a design that could be stitched. The square was sold for a penny and for an additional penny you could buy a skein of red thread. The squares were often used to create quilts, bedspreads and linens. The squares eventually went up in price, but folklore loves the origins. The stitches and designs were simple enough for children to use to learn and improve their stitching skills. The designs were often no more than just the outline of a motif like a flower, dog, or child. 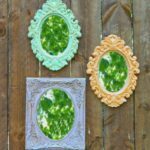 You could purchase these squares at the local general store and by mail order from ads in catalogs, newspapers, and magazines. The popularity of Eedwork embroidery died done after WWII, but it can still be found in books, magazines, and online. Redwork is simple and doesn’t translate well to fussy or overly detailed designs. Traditional Redwork designs included alphabets, samplers, farm animals, fruits, and holidays. 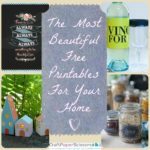 Want to celebrate National Embroidery Month? 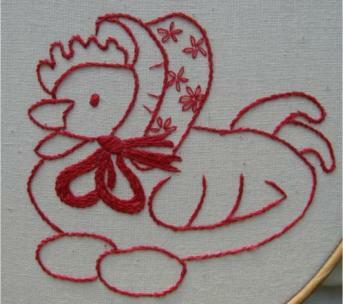 Learn how to embroider and find free project ideas below. I’m at the TNNA trade show. Basically, it’s the place where your favorite yarn shops and needlework shops come to see what’s new and get yarn, canvasses and more. And it’s amazing! SO much to see and do. The Fashion Show on Friday night was amazing, and Saturday I got to walk the show floor and see some of those fabulous fashions up close. 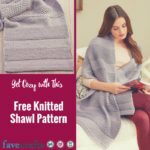 I’m constantly in awe of the skills and design ability of the industry designers — women (and men) that create the designs and projects that we are able to share with you on FaveCrafts, AllFreeCrochet, AllFreeKnitting, AllFreeSewing, and more. 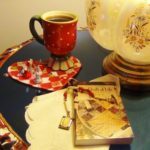 I plan to make more contacts at this show with some of your favorite yarn companies so we can feature even more great projects with you in 2011! So let me know what your favorite yarns are to work with. Do you have yarns you’d love to work with but haven’t tried yet, due to price or availability? Let us know what you are interested in by leaving a comment below and we’ll see what we can do about working with some of your favorite companies to provide projects, yarn giveaways, and much more in 2011. My favorite craft is embroidery. I had never tried embroidery until the summer of 2000. It was something so foreign and familiar to me at the same time. I thought large portraits would be wonderful and also that it was high-time for some less traditional themes for people to stitch. I founded Sublime Stitching in 2001 to re-inspire anyone to try embroidery. In 2008 I wrote a column called “Crafting A Business” and I have a new book of embroidery instructions, patterns and projects called Embroidered Effects (Chronicle Books). Future projects include “Hart Crafts” which I’m really excited about! 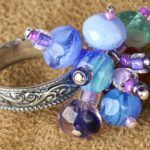 This pattern is done with two stitches, satin and seed, and the project page illustrates how to do each. You can simply print out the design and trace onto your surface. Enjoy! A certain fondness for pretty under-things and maintaining them well made me completely fall in love these Felt Corset Sachets. I’d love to throw a few in my top drawers (pun very much intended). 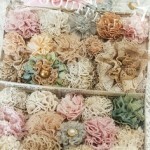 These were found through my blog source of embroidery eye-candy Feeling Stitchy. Flickr user rectangel shares the free pattern for three different Felt Corset Sachets, so check it out! For easier sachets, we have this awesome sachet project made with regular paper napkins. For lavender sachets you can also use in the bath, check out this tutorial. Though I can’t find this design on her blog or flickr set, she’s credit through this Neatorama post. 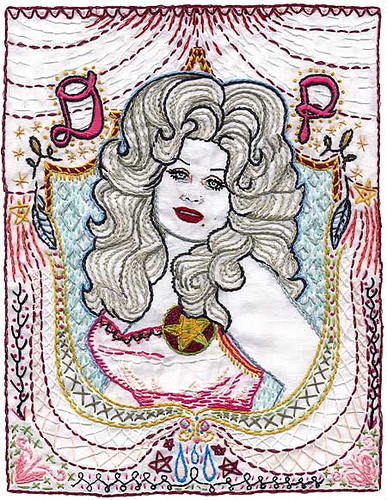 Most of you, especially those into needle crafts, probably already know about Jenny Hart. But just in case you don’t, check out her work ASAP. Not only is Jenny extremely talented and accomplished, her work never ceases to bring a smile to my face. 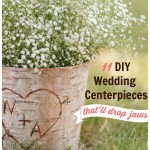 Check out her website or Flickr for some inspiration! While I’ve gathered the necessary embroidery materials and learned how to backstitch, I want to learn what else I can do with embroidery stitches. Last time, I didn’t mention how handy a bit of carbon transfer paper is for tracing a design onto your fabric. These come in different colors, even white for tracing onto dark fabric. You can also use iron-on transfers, which skip the step of having to trace and can be used several times. 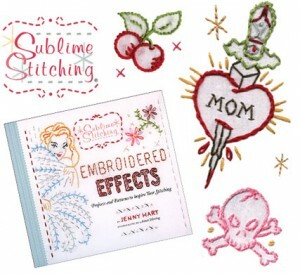 Sublime stitches offers hipper transfers, like zombies and pirates (if you were so inclined), but also tons of starter kits from artists so you can find just the right style for you. As a beginner, you really need a pattern, unless you want to doodle like Bella Dia. Aside from backstitch, here are some of the other stitches to try in embroidery. Split stitch-This stitch is perfect for making continuous, fluid lines (like I’ll want in my squid design). 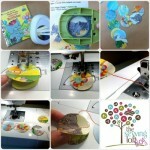 You bring the needle up through the fabric and make a stitch a short distance ahead in the direction you are stitching. You bring the needle back up through the last stitch, “splitting” the thread and continue stitching. Since you are splitting the thread, you’ll want to keep all six thread of the floss, at least to begin. Stem stitch– Stem stitch is like split stitch, but instead of bringing the needle up through the threads of the last stitch, you bring the needle right next to the stitch. The needle emerges a tiny bit behind the end of the stitch, pushing the floss to the side. You will be making slightly diagonal stitches along your line. Satin stitch– You can use satin stitch to fill in areas with the embroidery floss. You are basically making stitches across the outlines of your shape. Make a stitch across your shape and bring up the needle again right next to where you last brought up the needle (across from where you “exited” the fabric). This will make the stitches right next to one another to fill in the shape. Seed stitches– These stitches can also be used in fill in an area more sparsely. Seed stitches are very tiny stitches that capture a tiny amount of fabric. Many of them close together in random directions can fill in the inside of a flower or other designs. 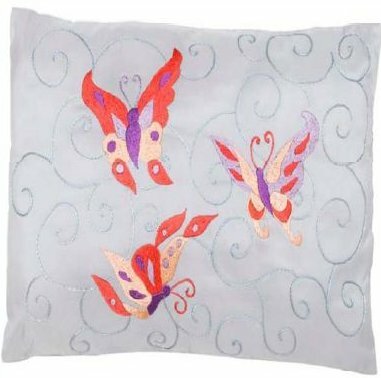 French knot– These are more advanced embroidery stitches but give beautiful, textured results. Basically, you are wrapping the floss around the needle once or twice before bringing it back through the fabric. 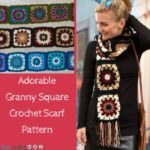 Check out this tutorial from purl bee. 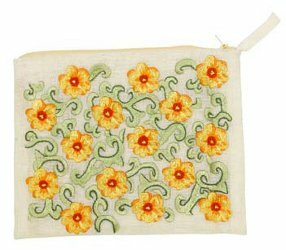 For diagrams of stitches, check out this excerpt from Jenny Hart’s book Classic to Cool Embroidery Projects. Personally, I forsee doing my first project in stem stitch. 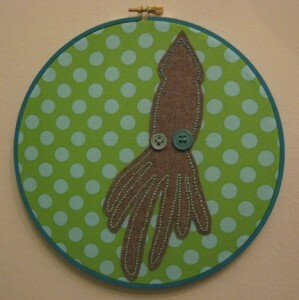 Squid Embroidered Wall Art from biffandbunny. She uses three colors of embroidery floss for a subtle change of color along the length of the squid, and the hoop is actually the frame for this wall art. Clever! Solstice Squids from hissen. For shear hilarity, this design with squids wearing scarfs wins. She can do custom colors and also sells the pattern. I am seriously considering buying the pattern. 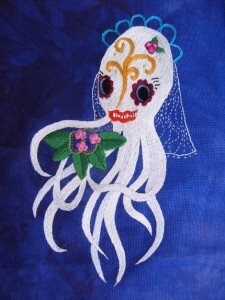 La Catrina Sugar Skull Squid also by hissen. Inspired by Day of the Dead sugar skulls, all I can say is wow. 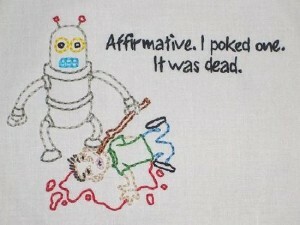 This is serious embroidery skill. I love embroidery but I have never tried it, nor do I currently have the necessary tools. Nonetheless, I have a project in mind. 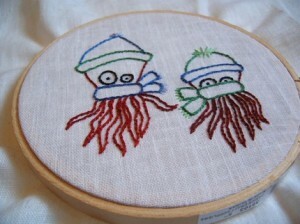 I want to embroider a squid onto a pillow. Before Christmas, I decided to start a collection of handmade squid things for my boyfriend, whose nickname is indeed squid (I know, it’s sickeningly cute). On Christmas day, my boyfriend unwrapped this screen-printed shirt, a squid vinyl card and our personal favorite this holiday, a cobalt blue “monster mug” with tentacle handle from Wildcard Pottery (her shop is currently on vacation but check it out when she returns!). Shopping for squid things on Etsy was ridiculously fun. Now, this is the squid design I want to embroider from Tim of It’s Nacho Time. I’ve already sung my praises of his squid-tastic blog with so many handmade items (his Halloween costume is classic). Tim designed this squid for a shirt design, but I feel like it could work for embroidery. No? I would want to trace my design onto the fabric with a pencil or washable marker before securing in the hoop. With a design like this and light fabric, I could easily just place a print-out under the fabric and trace. To secure the fabric in the hoop, you separate out the two circles, place the fabric over the one without hardware and place the other circle on top. You then pull the fabric taut between the two loops and tighten the nut until secure. Just like in sewing, there are different stitches that I can use to create my design. Backstitch is the easieset for beginners. Basically, I would make a knot in the end of my length of floss (I’ll probably separate it out to 3 strands for this finer design) and bring the needle up through the bottom of the fabric. I’d make a stitch to the left if I want to go right and to the right if I want to go left. That may sound confusing but it’s because you will be bringing the needle back up a stitch length in the direction you want to go and backstitching right next to the original stitch. The purl bee has a wonderful tutorial on creating french knots for a more raised and thus textured embroidery.